Atlanta, GA — November 18-19, 2010: An international group of Seventh-day Adventist professors, pastors, and graduate students met to present and discuss papers addressing the relevance of philosophy for Adventist thought and practice and to formally organize as a philosophical society. Participants came from Canada, Germany, Italy, Mexico, the Netherlands, Trinidad and Tobago, and the United States. Papers addressed issues ranging from epistemology to philosophy of culture that related to the theme of the symposium–“Adventism and the Love of Wisdom.” “I appreciated the variety and quality of the papers that were presented at this conference,” comments Fernando Aranda Fraga. “The issues that were analyzed and discussed are highly relevant for our church; we need more of this kind of multidisciplinary approach and more dialogue between theology and other disciplines like philosophy. In the end, conversations like this will contribute greatly to the mission of the church in our hyper-modern and post-modern world.” Dr. Aranda is a political philosopher and researcher at the University of Montemorelos in Mexico. Several important decisions were made during the business meeting that followed the paper presentations. The name “Society of Adventist Philosophers” was discussed and accepted. The wording of the society’s mission/purpose statement was discussed and refined. Also discussed and voted upon were criterion for membership in the society, dues, and the constitution of the advisory board. Members of the current steering committee, appointed last year at the initial organizational meeting in New Orleans, were asked to continue serving another year as an executive committee. The committee will work to implement the decisions made during the business meetings, to formalize a constitution and by-laws, as well as to plan the next symposium. The meetings also provided a valuable time of networking and fellowship. Christian Wannenmacher reflects, “I am glad to have made it to Atlanta for the conference. I appreciated the respectful environment to present my ideas about a necessary reconciliation of leading concepts in our Church. Beyond this, I enjoyed the numerous conversations, networking with like-minds, and the development of new friendships.” Wannenmacher is completing his doctoral studies in philosophy at Ludwig Maximilan Universität München and lectures at Friedensau Adventist University in Germany. 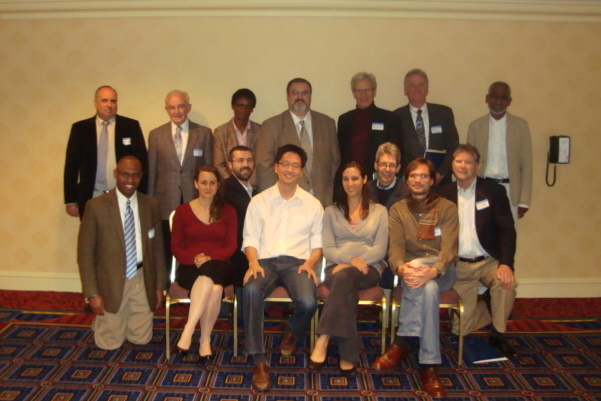 The society plans to meet again in November 2011 in San Francisco for a symposium devoted to an examination of teaching of philosophy in the context of Seventh-day Adventist secondary education. Details about the conference and a call for papers are forthcoming. The Society of Adventist Philosophers is a growing network of Adventist students and professionals interested in and engaged in this field of study. For additional information, e-mail: adventistphilosophy@gmail.com, or visit https://adventistphilosophy.wordpress.com. At the end of a long day, remaining conference participants gather together one last time. Dr. Jim Walters (Loma Linda University) welcomes the conference participants and shares some introductory thoughts. Presenters share their insights with a captivated audience. Conference participants meet in a room of the Atlanta Marriot Downtown. Dr. Nicolas Miller (Andrews University) and Dr. Hans Gutierrez (Italian Adventist College-Villa Aurora) listen to a presenter. Dr. Fritz Guy (LaSierra University) responds to a question by Dr. Nicolas Miller (Andrews University). Christian Wannenmacher (Ludwig-Maximilians-Universität München), the keynote speaker, listens intently to a presentation. Dr. Maury Jackson (LaSierra University) and Dr. Charles Scriven (Kettering College of Medical Arts) discuss their papers in a session moderated by Dr. David Larson (Loma Linda University). Dr. Fernando Aranda Fraga (University of Montemorelos, Mexico) and Dr. Fritz Guy (LaSierra University) present papers in a session moderated by Dr. Nicolas Miller (Andrews University). Conference participants enjoy conversations over lunch. Members of the newly elected executive committee (Dr. Abigail Doukhan, Oliver Glanz, Trisha Famisaran, and Zane Yi) lead the business session. Dr. Zack Plantak, chair of the Religion Department at Washington Adventist University, introduces the keynote speaker. You are currently viewing the archives for December, 2010 at Society of Adventist Philosophers.